Have yourself a Dinner Theatre Christmas and let St. Croix Off Broadway melt away all your seasonal troubles with its production of "Sorry! 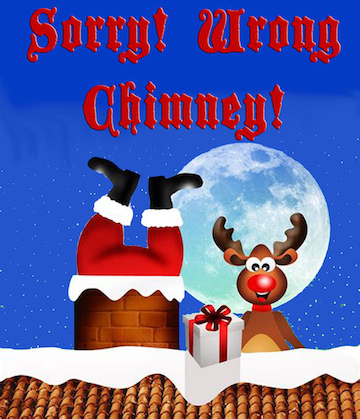 Wrong Chimney!" David Tuttle is moonlighting as a department store Santa so that he can buy his wife a fur for Christmas. He tells her he?s working late at the office, but she finds out he isn?t at the office. A suspected other woman, hypnotism, the notorious Santa burglar Kris Kreigle and his gun-toting fiancée, and a confused policeman add up to a rollicking tale that is hilarious Christmas entertainment! NOTE: New Year's Eve show includes an upscale dinner with nonalcoholic beverages, tip, tax & handling fee, and show for $88.40/patron. In addition, there is live entertainment by REWIND after the show for your dancing and listening pleasure until 1AM. It also includes champagne and party favors to ring in the new year together! Stay & Play for NYE (all the above including a hotel room with breakfast) is $255.80/couple. Evenings, $68 includes dinner off a menu with nonalcoholic beverages, tip, tax & handling fee, and show; matinees are a turkey lunch like Thanksgiving with nonalcoholic beverages & group dessert, tip, tax & handling fee, and show, $46.